Massage therapy is a great source of relaxation and healing, ideal for reducing stress. Discover other benefits such as relieving pain, muscle stiffness and aches. 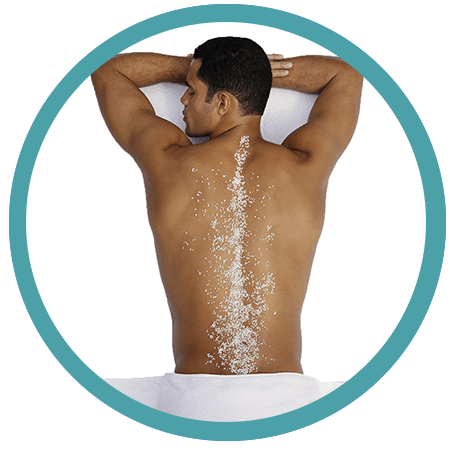 Complete relaxation of the muscles, tendons, ligaments and connective tissue. My approach is Swedish massage. This biomechanical technique uses oil and restores fatigued, and soar muscle by stimulating circulation throw-out the body while providing a moment of absolute relaxation. *A receipt for insurance purposes is available. Body treatments focus on relaxation while encouraging the body to eliminate toxins. Different massage techniques, body wraps and specialized products work synergistically to maximize results and enhance the experience of each individual treatment. Your back can also show signs of congestion and poor circulation. Perspiration, body hair, oiliness or dry skin may, for some, lead to problems such as ingrown hairs, acne or blackheads. The back treatment is a facial for the back! Following the same principles as a facial, it allows the skin to properly breathe and improve its overall tone. Special attention is paid to the elimination of black heads and ingrown hairs as well as the detoxification of tissues. A white clay mask softens and hydrates the skin while massage techniques help ease muscle tension. Our feet support us all day! A good foot massage not only helps restore balance to the body but also improve circulation, to fight against stress and the feeling of tired legs. During this luxurious treatment, you will discover the benefits of hot and cold compresses, exfoliation of the feet and a hot oil massage from the heel to toe. To add a touch of prestige, the calf is also included in this massage as well as a paraffin wax treatment! What a great way to take care of your feet! This foot treatment is specially designed to eliminate calluses (thickening and hardening of the skin due to friction). Lactic and glycolic acids help to eliminate calluses in a very efficient way. An antifungal cream with active carbon and essential oil of thyme and rosemary prevents foot odor without blocking perspiration. True luxury from head to toe. The KING treatment is a luxurious body care that promotes lymphatic draining while purifying the connective tissues in a very pleasant way. The skin regains a feeling of comfort while muscle tension is eliminated. The treatment begins with a deep exfoliation and is followed by an organic mud body wrap. The treatment continues with a hot stone massage for the body, including hands, feet and scalp. A mini facial is also included to maximise relaxation. This multitasking body treatment is ideal for people in search of total relaxation as well as those in search of improving the condition of their skin. THE KING’S HEAD is a luxurious scalp and head treatment. Our scalp can be sensitive, show signs of dryness or it can be oily. During this treatment, you will enjoy the benefits of aromatherapy which will be chosen according to your skin type. Natural essential oils soothe and relax while the scalp massage activates the micro-circulation and properly oxygenates the hair. The treatment begins with a skin analysis followed by a massage of the scalp, neck and shoulders. A hot stone massage technique is also incorporated during this luxury service. An ideal treatment for men looking for deep relaxation.